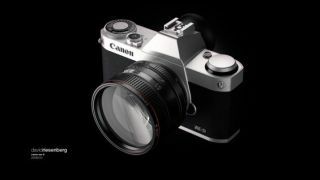 A new Canon mirrorless camera mock-up has been developed by designer, David Risenberg. The concept of the Canon AE-D has been inspired by classic cameras, the AE and AE-P and features a full-frame sensor drawn from the Canon 1DX (which has 18 million pixels). It also features a "CM-D" lens mount, which would not be compatible with current EF lenses. An adapter should make it possible, according to Risenberg. In terms of accessories, Risenberg has envisaged a 50mm kit lens with an f/1.0 aperture. An electronic viewfinder can be attached and removed via the hotshoe. Currently, Canon is the only major camera manufacturer without a mirrorless model in the market. The closest it has the Canon G1 X, a premium compact camera with a large sensor. Its biggest rival, Nikon, finally released its Nikon 1 compact system camera series in September 2011. The Nikon V1 and J1 both feature one of the smallest sensors in the market. If Canon did use a full-frame sensor in its CSC, it would be competing directly with the Leica M9, which is currently the smallest full-frame interchangeable lens camera in the world. The Fujifilm X Pro1 would also be seen as a natural competitor. Its premium price tag and APS-C size sensor (which, according to our tests, outperforms the Canon 5D Mark II's full-frame sensor in some areas) would seemingly rival any full-frame mirrorless Canon chose to bring to the market. Obviously it's difficult to say exactly what direction Canon will go in when, or even if, it decides to enter the market. It's anticipated that Canon will make an announcement at Photokina 2012, which is due to take place in September.